The Hilltop and Crestmoor Park neighborhood is an oasis in the Denver real estate community and is borded by 6th Avenue, Alameda Street, Colorado Boulevard, and Monaco Parkway. Originally developed in the 1940's, residents are drawn to the area due to its charming custom homes and lush landscapes. 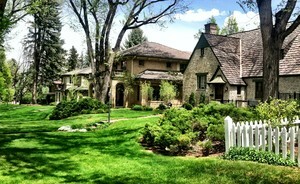 The neighborhood is also in close proximity to Denver's bustling Downtown, which is only a short 10 minute drive. Many people in this Denver neighborhood also take advantage of the different parks and recreational spaces that are nearby. Residents can relax and spend time at Cranmer Park to enjoy its scenic views of one of the other neighborhood parks which include Robinson Park, Burns Park and Crestmoor Park. Hilltop and Crestmoor Park is a thriving community with many homes that have historic architectural elements. Families can choose from smaller, more traditional homes that were built in the 1940's and 1950's or larger statuesque homes that have been recently built. Visitors often go there to take in the breathtaking scenery of gorgeous multiple story homes with lovely colonial styled architectural themes and in particular Cranmer Mansion, a mediterranian renaissance masterpiece designed in 1917 by local architect, Jules Jacques Benois Benedict.